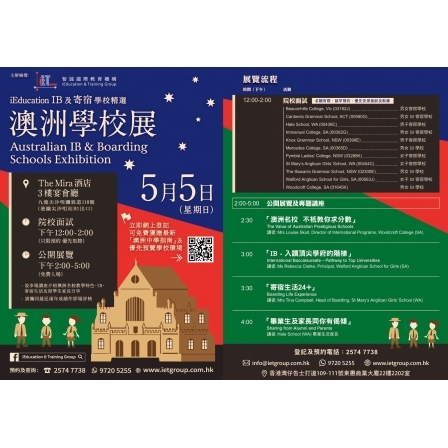 iEducation will be hosting the Australian IB and Boarding Schools Exhibition on 5 May 2019 at The Mira Hotel. The participating schools are Beaconhills College (Vic), Canberra Grammar School (ACT), Hale School (WA), Immanuel College (SA), Knox Grammar School (NSW), Mercedes College (SA), Pymble Ladies' College (NSW), St Mary's Anglican Girls' School (WA), The Illawarra Grammar School (NSW), Walford Anglican School for Girls (SA) and Woodcroft College (SA). If you have missed our Australian Prestigious Schools Exhibition on 24 February 2019, this is another opportunity for you to meet with our school representatives and find a suitable school. Please click on the video below to have a virtual campus tour of the Australian IB and Borarding Schools.